This early hanger-type cutlass is typical of the late seventeenth century. It is one of three examples found of the wreck of the Henrietta Marie. Flat-backed and curved, its tang is sheathed in a bone grip. Before enduring centuries beneath the sea, it had a D-shaped guard, quillons, and possibly boasted a “shell” for further hand protection. While no maker’s marks are discernible on this particular blade due to corrosion, another cutlass from the Henrietta Marie had a “running wolf” mark, making it likely to have been manufactured in Solingen, Germany. 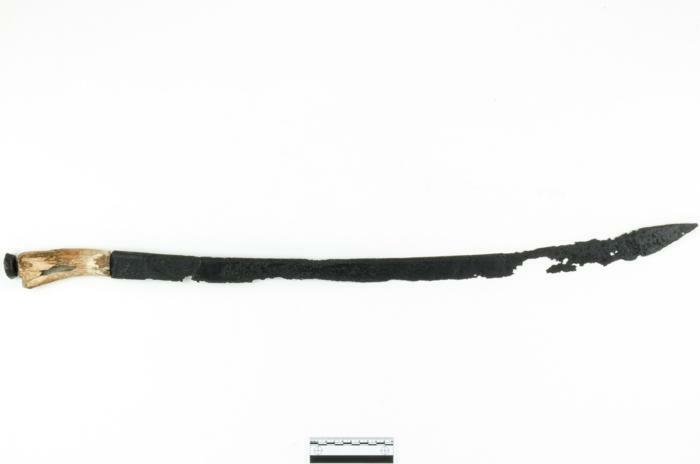 The third of the Henrietta Marie cutlasses was found in a wooden scabbard. Merchant slavers had much to fear. Not only might the Africans mutiny and try to escape or at least take over the ship, but pirates lurked along the route, ready to seize the cargo of any valuable ship. With a number of cutlasses available to the Henrietta Marie’s crew, a good fight was to be had for anyone giving them trouble. This blade, minus the grip, measures 27 3/4 inches (70.5 cm), a bit on the long side for naval cutlasses of the era. In a portrait by Godfrey Kneller, dated 1701, the renowned British admiral John Benbow is shown holding a similar weapon.